Many novelty-shaped sommerso pieces were produced in the 1950s. Italian glassmaker Murano is best known for this type of multi-coloured, multi-layered sommerso, meaning 'submerged' glass. Smaller pieces were mass-produced as souvenirs - impulse buys that could fit easily into a tourist's well-packed suitcase. The larger more refined pieces were produced in smaller numbers and more vulnerable to damage, making them scarcer and therefore more valuable today. The more charming and colourful the novelties are, the greater their appeal. Typical Murano novelties include glass eggs (less than £100), egg-timers (£150-£200) and animals. 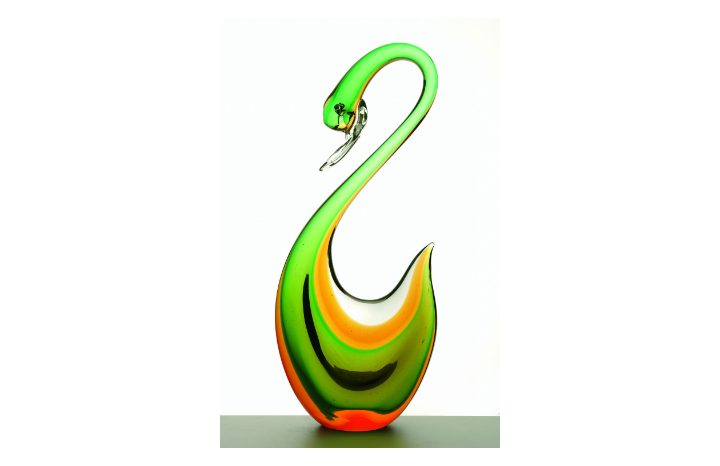 The 1950s Murano sommerso swan pictured above (37cm high) is valued at £150-£200. While this gorgeous Fifties Murano 'sommerso' duck below, with a green foil sticker, 16cm high is valued at £25-35.